Our house is 150 years old. In the past twenty-eight years, we have managed to fill it will all manner of collections, including…many quilts. I also live in New England, and my house and quilts lived a long portion of this past winter, surrounded by snow and frigid temperatures. One day I was sitting in the studio, looking out at the white… and longing for spring so much, that I started drawing birds. While sketching, I happened to look up at a quilt hanging up in the beams…and that became the inspiration for “Birds in Air”. 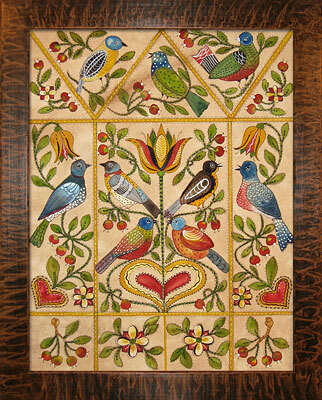 The painting is based on the quilt pattern of the same name…three triangles at the top, representing birds in flight. The rich, bold colors just felt good to paint and help provide "flight" for me too. Hand detail upon detail is rendered on washed archival paper. A mixed media piece, this one-of-a-kind painting was done in watercolor, gouache, acrylic and pen. The vinegar painted frame, was hand grained and finished in period style.